Discussion in 'Passarounds & Loaners' started by Rick, Jul 10, 2018. Recently I had a chance to use a utility/petty by Harbeer Chahal of HSC III Knives, and he asked me to offer it as a passaround to forum members. I'll let him introduce himself. 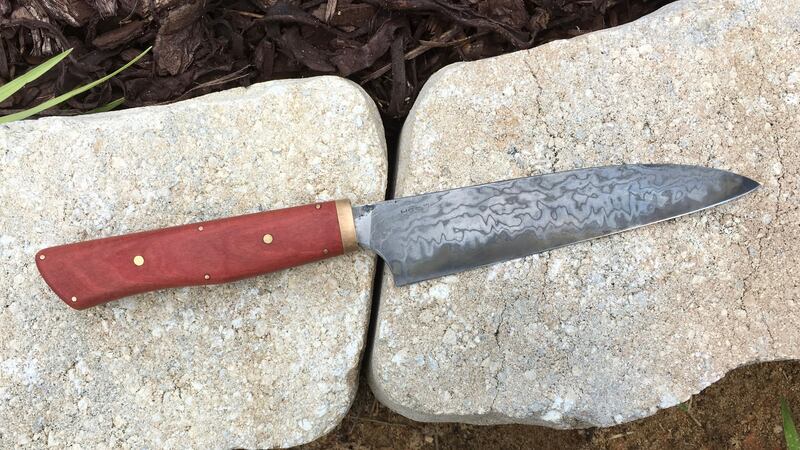 "I forge Japanese laminated steel and heat treat myself as taught to me by Murray Carter. I've also traveled the country learning from other Masters. Mike Vagnino taught me slipjpint folders and James Rodebacugh taught me handles and guards. "I work with high carbon steels only, mostly laminated Hitachi white steel I get from Murray, Damascus Suminagashi from the UK, and 1095, Soon I'll work with 1084." The passaround knife is a Western handled 151 x 34 utility/petty made from Takefu Shiro2 clad with 22 layer mild steel suminagashi. The handle is pink ivory with a silicon bronze guard and G-10 frame. The usual guidelines apply - keep it a week, sharpen it only if you know what you’re doing, insure it when shipping to the next person on the list. Post in this thread when you get the knife and when you send it to the next person. Harbeer would appreciate any comments or criticism, and you may post about your experience in this thread. As before, preference will be given to Site Contributors. You should have a minimum of 50 posts or be known to me. PM me or reply in this thread if you're interested. Hi, new member as of today, but I would definitely be interested in getting my hands dirty in the forum. . The passaround is now complete. Many thanks to Harbeer of HSC III Knives. I wanted to give the knife as much use as possible so I used it as my only knife for over a week, even though I would have reached for a longer blade several times. In this time, I broke down a pineapple, several mangos, a few navel oranges, and a small cantaloupe. I sliced strawberries, diced potatoes, sliced tomatoes, and broke down bell peppers. I sliced steak, sausage, and boneless chicken breast. I even sliced a loaf of French bread. I tried to find some task, any task, that would uncover a weakness, but in the end, I couldn’t. I noted very good release of food, whether it was raw potato, a slice of melon, or diced onion. The tip is nicely thin, and it was easy to make the horizontal cuts in an onion when preparing to dice it. The lack of belly in the profile allowed me to use it on a board without difficulty. As Harbeer requested, I did not use it near bones, though I was certain that it would handle breaking down a chicken. Edge retention was very good. I touched up the edge on a Shinden suita at the end of the fifth day, not because it needed it, but that I wanted to see how it felt on the stones. I was able to bring back the edge without any problem. It felt as good as any other shirogami blade I have sharpened. I found the handle to be very comfortable. I expected the edges of the bolster to be sharp against my fingers, as I have found to be the fact with a Tanaka Ironwood petty I have, but was pleasantly surprised to find that breaking the edge as was done prevented this. Likewise, the spine was smooth. One very minor thing worth mentioning is that the spine of the knife is not even with the top of the handle, but is somewhat below it. I found that my finger hesitated on the step when I changed my grip rather than sliding smoothly. The pink ivory wood was very pleasant to hold. I think it is an excellent choice for a handle material. The grind had only a little convexity, at least that I could see when putting a straightedge against the blade face. Release was good, nonetheless. I did notice a small imperfection in the spine. It’s inconsequential to performance but I did want to mention it. Bottom line, I would be happy to have this knife in my collection. Nice write up Rick. 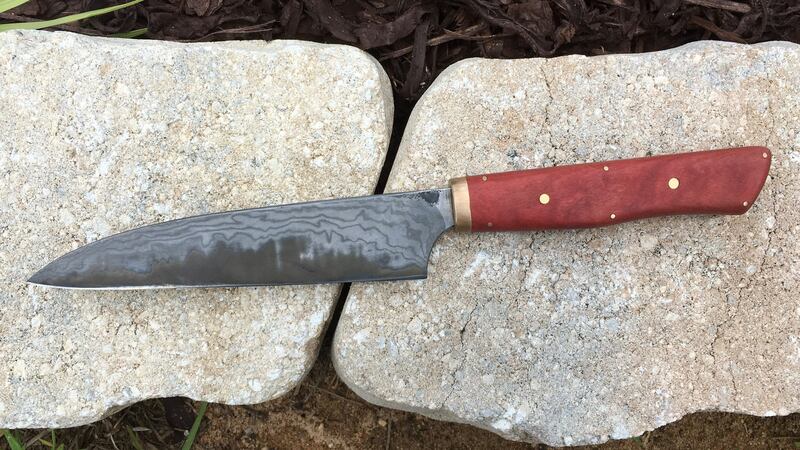 Been checking out his work on instagram, makes some good looking knives. That being said, I put the petty to use on anything that size was going to be an issue for. All in all this knife is a true performer, I would gladly add a piece of Harbeer work to my collection. ..